CentrikBlogsLegal AdvisoryAuthentic Legal AdviceWhat is an NBFC? 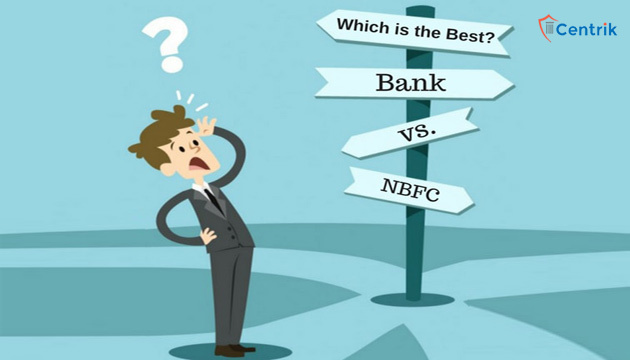 What is difference between Banks & NBFC? It is dispensable that every person has ample funds to fulfil their concern. The only prime solution that can be looked at is either getting a loan from the bank or from some financial institution. In many cases, people cannot qualify for the norms or requirements of getting a loan, which is when a Non-Banking Financial Company (NBFC) comes under the purview. Q. What is an NBFC company? A. A Non-Banking Financial Company (NBFC) is a company registered with the Companies Act, 1965/2013 of India, engaged in the business of loans and advances, acquisition of shares, stock, bond sire-purchase, insurance business, or chit business. It does not include any institution whose principal business is that includes agricultural or industrial activity; or the sale, purchase or construction of immovable property. Q. How to differentiate between a Bank and NBFC? It is not a part of payment and settlement system and cannot issue cheques to its customers. Deposit insurance facility of DICGC is unavailable for NBFC depositors unlike in case of banks. Q. What are the provisions of registration with Reserve Bank of India (RBI)? A. Commencing a business of non-banking financial institution is defined under section 45 I (a) of RBI Act, 1934. It should have a minimum fund of Rs. 25 Lakh (raised to Rs. 2 crores from April 21, 1999). The company is required to submit an application for the registration in the prescribed format including documents crucial for bank’s consideration. Once the bank is satisfied it will issue a certificate of registration stating that conditions as stated in Section 45 I (a) of the RBI Act are fulfilled. Q. What are the types of NBFC’s registered with RBI? Merchant Banker/ Venture Capital Fund Company/ Stock-exchanges/ Stock-brokers/ sub-brokers are regulated by Securities and Exchange Board of India (SEBI). Chit companies are regulated by the respective State Governments. Nidhi Companies are regulated by Ministry of Company Affairs, Government of India. Q. Can NBFC’s accept public deposits and what are the requirements for it? A. Not all NBFC’s are privileged to accept public deposits. Those NBFC’s holding a valid certificate of registration with authorization to accept public deposits can accept public deposits. NBFCs cannot offer interest rates higher than the ceiling rate prescribed by RBI from time to time. The present ceiling is 11% per annum. The interest may be paid or compounded at rests not shorter than monthly rests. NBFCs (except certain AFC) should have a minimum investment grade credit rating.